Roasting cherry tomatoes really intensifies their flavor – which is a good thing since tomatoes are not at their best right now. This couldn’t be an easier sauce to make – just throw cherry tomatoes, oil and garlic in a pan and roast for 15 minutes and your sauce is ready. I used thin spaghetti but you can use any pasta shape you have available. 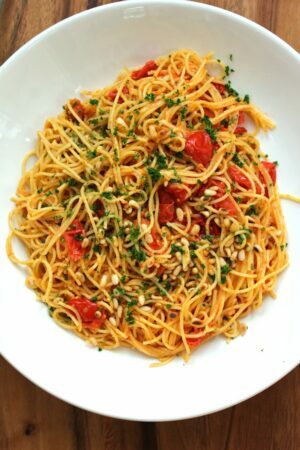 A quick sauce for pasta made with roasted cherry tomatoes. Place cherry tomatoes, olive oil and pepper in a roasting pan. Toss briefly. Roast cherry tomatoes in oven for 15 minutes. After 8 minutes, add thinly sliced garlic (adding half way through the cooking time will prevent it from burning). While tomatoes are roasting, bring a pot of water to a boil. Add pasta and cook according to package directions. Toast pine nuts in a frying pan over medium heat. Make sure to shake the pan so the nuts don’t burn. It should only take a few minutes to toast the nuts. Remove cherry tomatoes from oven after 15 minutes. Most of the tomatoes should have burst and released their juices – squish any tomatoes that have not burst. Drain pasta and add cherry tomatoes and their juices – toss gently. Add toasted pine nuts, parsley and parmesan cheese.